Creative ideas are exciting because they're unpredictable. Two people can look at the same things and their minds go off in completely different directions. 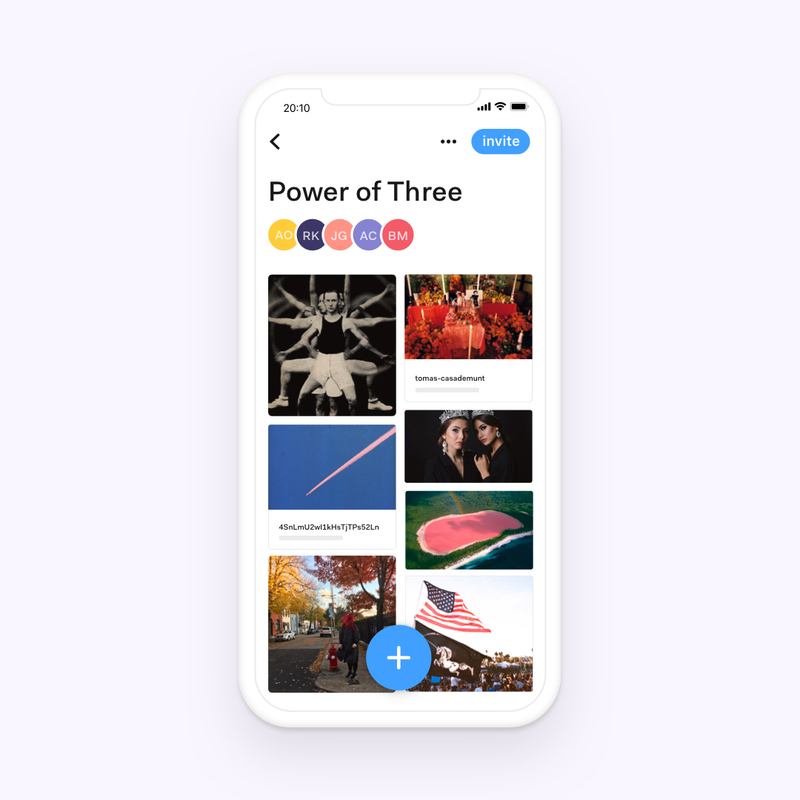 Power of Three is a celebration of that spirit, produced with Collect by WeTransfer. Download Collect now and see how it sparks your ideas. Collect is the best way for visual thinkers to save and organize all the great content they find online. What you do with it is completely up to you! We created a Collect board – a mixture of photos, videos, links and songs – and sent it to a writer, who was asked to create a short story inspired by the items we provided. That writer then edited the board, took some stuff out and added some new stuff in, and we sent that new board to another writer – and another, and another, and another. I dream of a world of visibility. But visibility will only come when I am seen. My village sits in between two large mountains. Nestled close to the second mountain is a waterfall that nobody has been able to go close to for over a hundred years. The sound of the falling water is deafening, electrifying even, as it is believed to crash against bentonite rocks. The only way to get water is to go to a silent stream flowing downwards from the waterfall, ten kilometers away. The water is clear, incandescent with goldfishes and pretty water lilies. When stored in a clay pot, it stays cool and refreshing, and never breeds algae. The waterfall is an untapped natural source that has existed since the tales of our ancestors. But in 1995, a water company found its way to the King, asking for permission to drill and bottle up water from the waterfall. A town square meeting was held, and the people were summoned. In a slow and meticulous voice, the King asked if the company could go ahead with their intentions. The people said no. The world changes, the people change with it. Sometimes, people are not so lucky to have options given to them. Land is taken, environments altered. There are always two sides to a story, but how well can a story be told by two mouths? Versions are diversified, sifted to favour the storyteller, leaving the truth to hang like a dead clock, forgotten on a wall. The world changes, the people change with it, a constant crystallization of ideals. But the consequences of such change can affect everything it stands for. History gets buried under the pile of civilization. The world becomes overwhelmed with its knowledge, its inventions, and dies slowly like a man with a weak heart. I dream of a world of visibility. But sometimes, for one to stay alive, they have to be invisible. Amara Okolo is a lawyer and writer based in Nigeria. The men had no say in where the group went next. Life was simple enough in those days: the drones were dispatched first, the women gathered in Attila’s dome to surveil the frontier, they argued and argued until they agreed. This was how the women worked. They were what you might call solution-orientated, obsessed with details and plans and getting things right. This time, the arguing, point-for-point, voices rarely eclipsing a regular speaking tone, only lasted a few minutes. We didn’t know what to think, except that the screens must have shown something inordinately good or inordinately bad. There was no school the next day. Instead of us big kids teaching the little kids and the little kids teaching the babies, we were all shepherded by the men into the main dome, a big white thing that was flappier than any of the women’s domes or the hospital dome or the art dome and which was always set up right in the middle of everything, no matter where we were or how far we had walked to get there. No school was usually exciting, but something felt different this time. The men brought out all our family trees, going back to when each family was a unit with a dome of its own. And then, next to each uncle and auntie and gramma and grampa, they showed us how to write a little prayer. Uncle Erden, thank you for watching over us all these years, please protect the women. Auntie Gerel, thank you for watching over us all these years, please protect the men. Grampa Naranbaatar, thank you for watching over us all these years, please let protect us kids. Gramma Sarangerel, thank you for watching over us all these years, please light our path. The men wouldn’t tell us why were doing this or how dead aunties and uncles and grammas and grampas could help us at all. Maybe the men didn’t know either, I realized later. They re-filed the family trees, now with scribbles all over them, into the steel cabinets. We linked pinkies and slunk out of the dome and when we looked up, there were faces in the bright sky. Rawiya Kameir is a writer, critic and editor based in New York. “So,” the mayor said. He cleared his throat a little. “The pink lake.” A murmur in the room at the Pink Lake town council. Everyone had come out for this: mums, grandparents, hairdressers, dogs. Everyone was whispering about the lake. “The, ah, the thing is,” the mayor said. He held the bridge of his nose between his eyes. “The thing is, it isn’t pink.” Pink Lake is a town in south-western Australia that is named for the lake it sits on, Pink Lake, which is pink. Or at least it was. Nobody knows the special alchemy that makes a lake go from blue to pink, but there’s some magic to it – salt, algae, freshwater in, salinity out. You cannot simply make a lake pink, the lake must decide itself if it wants to be the colour of roses. Ten years ago the lake started to thin and fade, less like a washpot stirred with fuchsia paintbrushes, more like water rinsed with chicken. And worst of all it was misleading. Instagram bloggers kept flying 36 hours to take fitpics by the pink lake, and went furious when it wasn’t pink enough, dinging the hop-bells in local hotels, growing hot and furious under their large floppy hats, their gifted sunglasses, their bandeau and balayage. “It isn’t pink,” they said, Snapchat filtering their fury, and they were right. Imagine Taylor Swift, here, in pink! Souther, wester, there was another lake, still pink and still strong, singing like a choir. While Pink Lake died, Hillier thrived: the papers used to call the lakes “two queens in jewels,” two rubies half-buried in the sand, pink-hot tourism spots that emptied the cities every summer. And then just Hillier remained. Every Sunday the band played – pink suits, pink ties, white shirt – and down the main promenade they sold pink things – floss and popcorn and taffy and badges, and the sun shone and the bloggers flocked. Their mayor beamed and laughed and made speeches. “Cut me and I bleed pink!” he said into a microphone, feedback squealing up the coast all the way to PL. Every town with middling tourist success has the same rumour, and Lake Hillier was no different. Taylor Swift was thinking of buying a holiday home there. The air crackled with the sheer excitement of it. Imagine Taylor Swift, here, in pink! The lake didn’t even know it was pink, know it was special. The plan was simple, which is why it didn’t work. As the mayor chugged out into the center of the lake and watched the sun set red before him, gallons of dye leaking our behind, re-pinking the lake in the name of siren-calling the bloggers. Hot towns smell of pencil lead and dust, but the air took on another smell that night: sulphur, disaster, the acid scent of fish bobbing dead on the shore. The ones that survived the first onslaught spent the next few months going bumpy, one-eyed, grew horns or flapped in circles. The town dragged the mayor through the streets and the lorries came to drain the lake of its sullied water. The sun scorched the salt from the sand. Birds quietly land on nothing. In 1848, they found the pink lake – John Septimus Roe climbed half a mountain nearby and stared down at the rose-coloured pool below, and named it Lake Spencer after the magistrate who pushed western Australia into the new century. In 1953 they named the pink lake Pink Lake, and in 2017, after ten uninterrupted years of un-pinkness, the mayor started printing out the enormous stack of forms required to change it back again. The circle of pink encloses. Think of the clear air there, on the mountain, shimmering under human feet for the first time in 100,000 years. The lake didn’t even know it was pink, know it was special. We found the lake pink, we named the lake pink, we flocked to the lake pink, we unmade the lake pink. We wither everything we touch. Joel Golby is a writer based in London. This is the first time you are hearing my voice. A raspy wind passing through the hollow of my throat, the mime of birdsong, the passing of signs from one brain to another. Like two bodies, wrestling each other to the ground, but gently, with precision and grace. The skill of disarming one another with forceful embrace. How wrestlers crouch and bend over their feet, touch the ground with their knuckles, lift their chins and meet the other’s gaze with a glint in their eye. That marking of intimate communion, as much to do with dominion and as it does with surrender. An address. I address you, here, in the ring of our shared desire. First we step inside the circle. Then we lick our fingers. Then we ask each other how to dance, what the weather is like, if we like papaya with salt, who are brothers are, how we breathe this contaminated air, how we breathe, how we breathe. Our voice is our breath, I tell you. I can you hear you breathing. I can hear your voice beating against mine like two bodies wrestling, with precision and grace, down the hollow of my throat. The most beautiful thing about love... is that it bears no thought or calculation. But I don’t really understand what you do in your work. I imagine you like a magician, or a scientist, working with abstractions, presiding over explosions, over processions of the observable phenomena that shape our universe and the provisional conclusions we can draw from them, like water from a well that never dries. I imagine you with a wand perhaps, or a magnifying glass, kneeling down in the dirt and motioning over to me, to look through the instrument at the sand and notice how it flows, mathematically, in accordance to something called Langevin dynamics. It’s another name, you tell me, for shadow work. We decide to name our findings A General Theory of Inter-Cat Choreography and try to present this new vocabulary of movement to our families and loved ones. We explain, only a cat knows why it turns, what draws it, almost instinctively, to shift its attention. How many generations of psychic kneading, of biological carving, of inherited formation has offered us this one, ineluctable form of expression. Only a cat knows. I look up at the clouds and remember nothing exists, but everything exists within it. The most beautiful thing about love, you once told me, is that it bears no thought or calculation. It only bears its own gestures of abandon. How it can sometimes feel like the tightening of knuckles, or the smashing of fruit between fingers. Like a sway that is about to break into fall, a string that gets caught and, with sudden life, begins to tug at you from behind. Like a trumpet playing, somewhere, catching a drift, like a scent. Sometimes I don’t know how to live without calculation. I become a vat of impressions and assessments. I look up and the clouds turn into shapes, they seem to represent something. I begin to read them for disaster predictions, for signs. I take notes. Other times I let the sky pass. I sit out at my front porch and let myself be moved by sunlight’s shadows. I listen to the trumpet, to the birdsong. I look up at the clouds and remember nothing exists, but everything exists within it. It. Ana Cecilia Alvarez is a writer and essayist born in Mexico City. She now lives and works in Los Angeles. The man’s wife has left her jewellery, and the investigator will count every necklace, earring, designer bag and shoe and conclude that there is nothing missing. She has taken two small bags containing only necessary items, all bought with cash and concealed for weeks in the back of a spare-bedroom wardrobe. The driver of the modest car, paid well and told very little, waits already at a drive-in movie theater two miles from the big house. It’s a double-feature, two wrestling movies, and the driver of the modest car settles back in the front seat and lights a cigarette. He is glad to be out of his small apartment and away from the screaming baby, gladder still for the fat roll of notes in his pocket, half now and half later when the job is done and the woman is on the plane. It’s been raining ceaselessly for two days, but as the second feature starts, the drizzle stops and the cicadas sing and at the big house a cake for the husband is wheeled out. Someone in the crowd of guests says did you see the new wife and someone else says sad girl isn’t she and someone else says are there really 50 candles on that thing and someone else says yes I think there must be. Half a mile away already, the woman who is a wife but also not a wife walks over the wet, pink dirt towards towards where she trusts that the modest car will be waiting. Behind her she hears a sudden swell of singing and then applause. A grand firework display begins over the big house, but she doesn’t turn to watch. The night is young and the air smells like sweet earth and the party is raising its voice and nobody will notice that the woman is gone for hours yet. The cake is cut and guests dance incautiously on the rain-slick deck and two women holding glasses of golden wine clutch each other and laugh like children. Down on the beach the sea tugs at the shore and soon a modest car with two passengers will pull out of a drive-in movie theater and a woman will weep relief into her hands and the driver, embarrassed, will clear his throat and turn on the radio. He’ll roll down his window and look up at the clean, dark sky with its sweep of clean, bright stars. He will think to himself that it looks like a wide and smiling mouth. Beth McColl is a writer based in London.